This is made with the wool that went through my Cortinarius sanguineus dyepot—the small wine-coloured mushrooms that pack such powerful colour (see my post of February 9). Any dyed wool, once it’s spun, will lose some of its colour intensity, so I didn’t expect this to work up in the bright red I started with. Nevertheless, I’m pleased with the results. I spun this Merino more tightly than I’d planned to, so after it was chain-plied, the three-ply yarn felt more like a soft cord. I decided to do some improv crocheting and ended up with this very long scarf-like garment that wraps around my neck three times, with lots left over to play with. While my dyepots are finished for this season, the spinning continues. I’m working on the merino from the multiple exhausts of the beautiful little Cortinarius sanguineus—all the mushrooms went in at once, and I put the wool through successive dyepots until the colour was more or less gone (see my post of February 9). 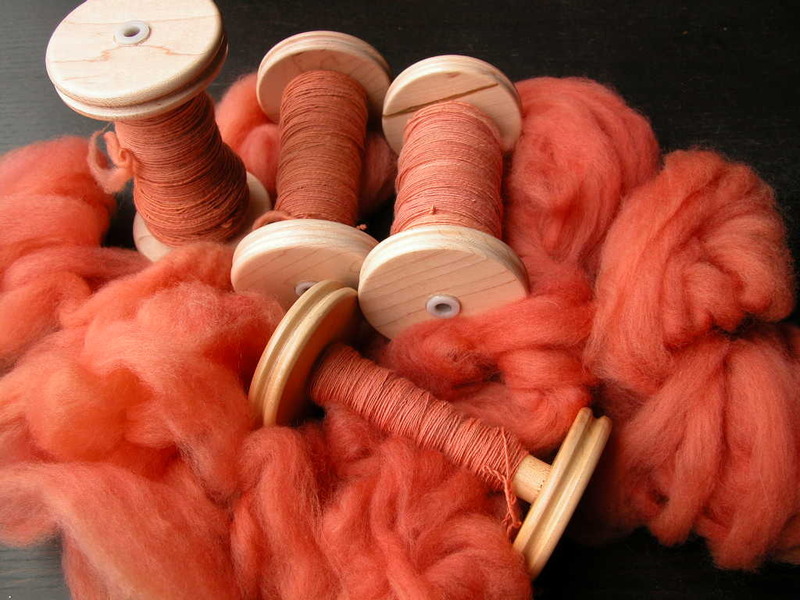 I’ll have four good bobbins of singles, which I plan to then chain-ply, or Navajo ply, which will result in a three-ply yarn without any waste. Because I plan to crochet with this yarn, I’m spinning the singles in a counterclockwise direction, to be plied clockwise. 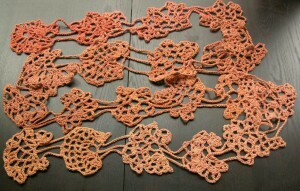 I have no idea how many yards I’ll end up with, but because I want to make a shawl with it, I’ll choose a pattern that will allow me to continue until I run out of yarn. 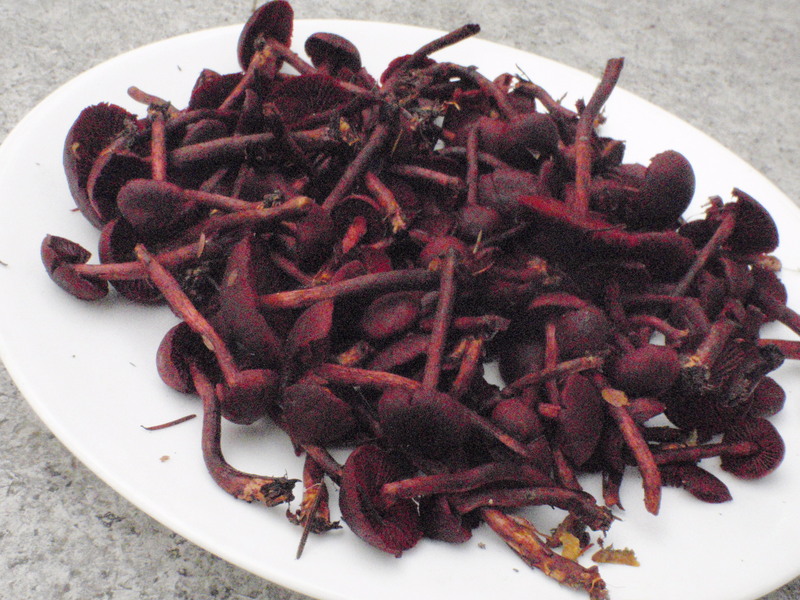 I saved the best for last—my collection of dried Cortinarius sanguineus, which didn’t look like much on the face of it, but look at all the colour they gave me! I put all the dry mushrooms into an old stocking, boiled it up for a couple of hours, then left that in the dyepot for all the exhausts. The first dyebath is on the left (with one iron-mordanted roving—the darker one), and progressive exhausts go from left to right. 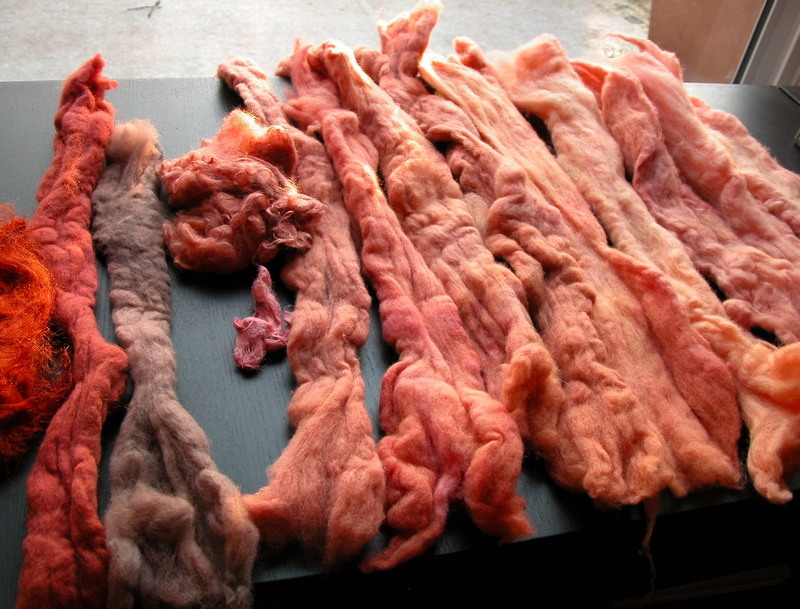 The bright orange on the far left is “icicle,” a sparkly synthetic fibre that always picks up amazing colour. I’m going to use this to spin one yarn, going from darker to lighter—this mushroom is too special to blend it with anything else. 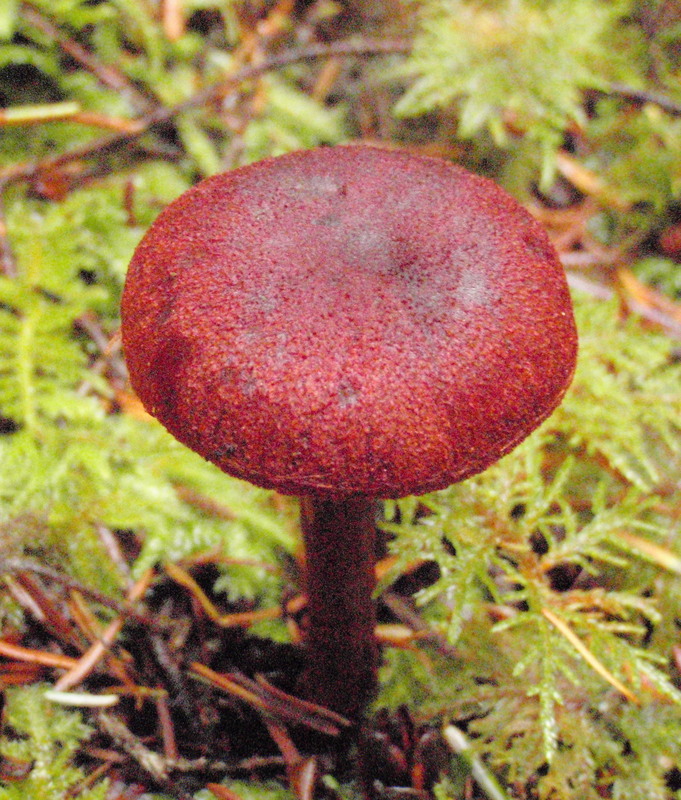 We found a spot, not that far from us but requiring a bit of effort to get to, where I found the Holy Grail—Cortinarius sanguineus—in such abundance that this year I’m going to have more than just a sample dyepot. 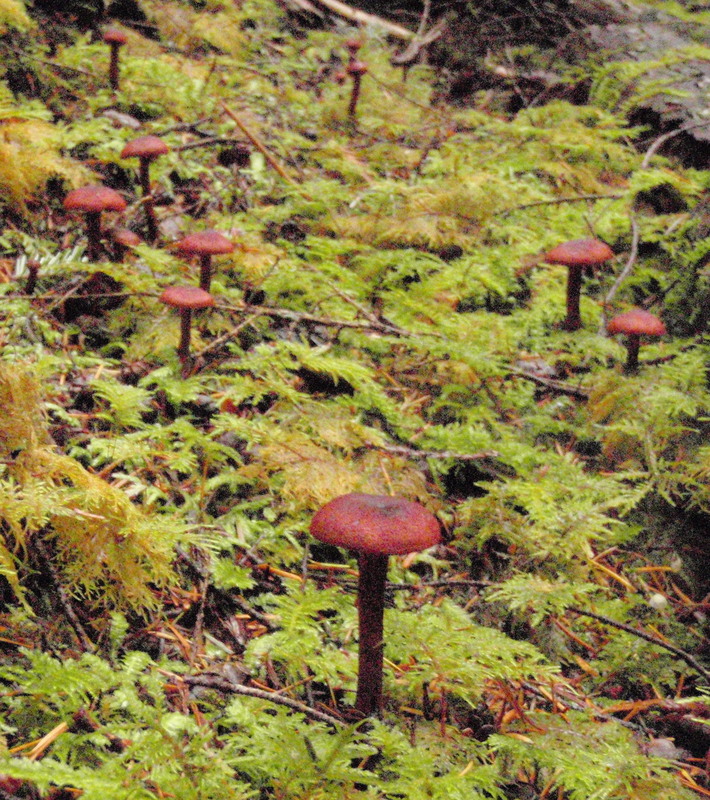 By the time I found this population (I don’t want to call it a cluster, because the mushrooms weren’t exactly clustered), we were running out of time and daylight, so I wasn’t able to explore further. Next year I’ll know exactly where to go, a few metres above a little stream and in fairly deep shade, and I’ll walk all along that elevation, where these little beauties obviously love their surroundings. The dyepot will be happening soon—I think silk will be appropriate for this one!